Five or six years ago I took an interesting class on Feng Shui. I've enjoyed reading and learning more about it ever since. When I was contacted by the Feng Shui at Work website asking if they could do a Guest Post on our blog of course I said yes. Granite can greatly enhance the feng shui in your house. For those of you wondering exactly what feng shui is, it is an ancient Chinese system designed to maximize the positive chi within a home. Chi is an energy or life force that can promote a more relaxing atmosphere. Granite is a beautiful material that can contribute to a feng shui design by acting as the earth element. Granite is a natural material that is very unique. There are specks of gold, white, black, yellow, tan, and other earthy colors. 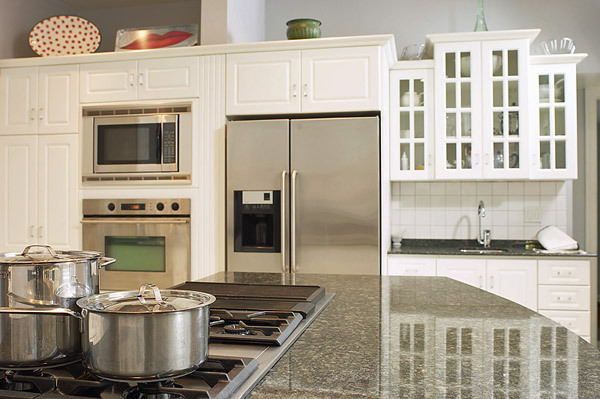 Although granite is never a solid color, it can be purchased in a wide variety of dominant colors. For example, a black granite counter will have specks of other colors upon closer inspection, but the main color will be black. This extraordinary quality adds dimension and luxury to any room. Kitchens are representative of prosperity, nourishment, and wealth in feng shui. Granite countertops create a presence with unique richness and beauty. Consider a granite island if your kitchen has the space. Not only will it provide more cabinet storage and counter space, it will also allow the cook to be closer to the guests. In feng shui, a cook should not be facing a wall as in most homes today. If granite countertops aren’t an option for you, consider granite floors. Durability will never become an issue, leaving only positive energy to flow across your beautiful, unique floor. The earth tones maintain neutrality, leaving endless options for the rest of the décor. The versatility also leaves options of granite for your bathroom. This is often one of the most complicating rooms to apply feng shui. The water element is overpowering in a bathroom leaving the room feeling unbalanced. Granite is an earthy element which can help to bring back tranquility and peace to a room that is known for ungrounded energy. A granite fireplace can balance the fire and earth elements while being a beautiful focal point. Gathering around the fireplace is relaxing enough without feng shui, but balancing the elements helps to create a constant flow of peace and tranquility within the home. If one of the elements is too strong, as in the case of a fireplace, the energy will avert and the feng shui mission will be failed. Granite is a diverse material that can be used virtually anywhere in your home to assist in balancing the elements and create a relaxing experience. We spend half our lives inside our homes, and they should give us positive feelings to aid in our overall health. Feng shui has been around for centuries. It’s hard to deny its power. Enhancing the experience with granite will be an investment not only in your home, but also in your overall health and happiness. BIO: Michael Schnippering is the founder of of Feng Shui at Work. He is committed to the true art and science of Feng Shui. Over the years his Feng Shui practice has taken him to various parts of the United States, Germany, France, Spain, Colombia and Argentina.